With Valentines Day only 2 days away, means a seductive new date outfit is in order! If you haven't got one yet, don't panic. Here's a selection of the latest trends that are perfect for a romantic day and night. Take note of the amazing leather trend and heart print seen all over the highstreet and catwalk. Key pieces for this season are printed jumpers and statement jackets to carry though into spring in style! 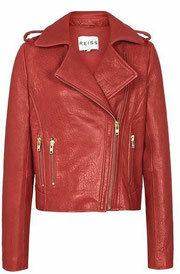 A red leather jacket is a bold statement piece that will add an edge to a plain Valentines Day outfit. Perfect for a dressed up or down occasion you can team with anything from jeans to a pretty dress! A classic red dress is always a hit on Valentines day, it's sultry and feminine and makes a big impact. Taylor Swift looks effortlessy chic and cosy in this heart print jumper seen on a number of celebrities! Heart print isn't just for Valentines day, it's popping up on jumpers and scarves on the highstreet. Cover up from the cold with this staple piece, in a beautful deep red, perfect for Valentines day. 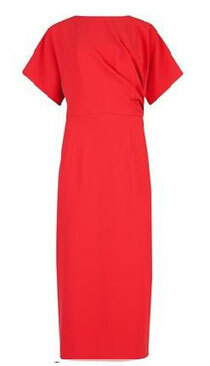 Make an impact with this stunning red dress, with subtle pleats and flattering shape it oozes elegance and style. 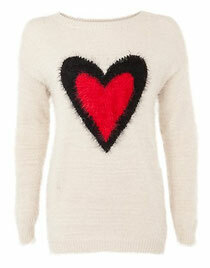 For a more cosy Valentines day this super cute jumper will keep you warm and look very chic! Be one step ahead in these pastel coloured sandals that are perfect for adding a touch of spring to your outfit. 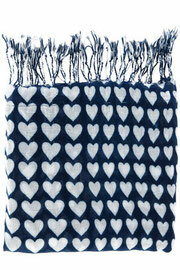 A simple heart print scarf is an adorable and pretty way to show the Valentines spirit. Add a heart print trend to a simple outfit to easily infuse this trend to your wardrobe.